A HUMAN PERSPECTIVE Time and again in its early history, China was attacked by invaders from the steppes of Central Asia. The Chinese built and extended the Great Wall over many centuries in an attempt to keep out such invaders from Mongolia. From the Yellow Sea to the Gobi Desert, the wall twisted for thousands of miles across China. The wall was built by hundreds of thousands of peasant workers. Many died from the backbreaking labor or the severe weather. The Great Wall remains one of the largest building feats in history—partly because it had to cross mile after mile of China’s difficult terrain. East Asia stretches from the western provinces of China to the eastern coast of Japan. Mongolia, Taiwan, North Korea, and South Korea are the other countries in the region. 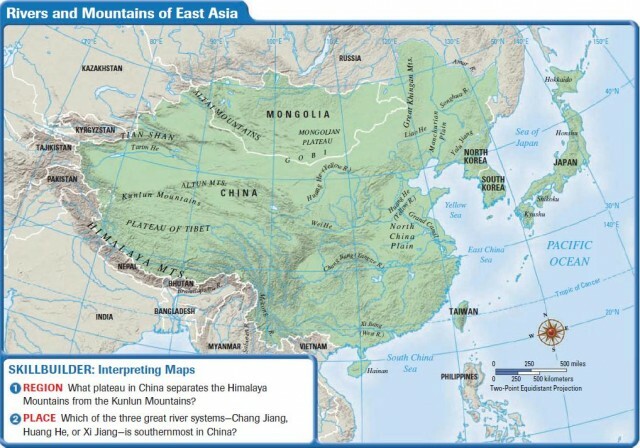 East Asia includes high mountains, vast deserts, cold climates, and Pacific waters. The mostly rugged terrain was formed by the collision of tectonic plates. One result of these natural barriers was to limit people’s movement and increase their isolation. High mountains in the region limited contact between people living in China and in other parts of Asia. The world’s highest mountains are located on the western edge of East Asia in southwestern and northwestern China and western Mongolia. The Kunlun Mountains, which are located in the west of China, are the source of two of China’s great rivers, the Huang He (Yellow) and the Chang Jiang (Yangtze). In southeastern and east central China, the Qinling Shandi Mountains divide the northern part of China from the south. The landscape of East Asia is among the roughest in the world. The mountain areas in the western part of the region restricted movement and were underpopulated. Although few flat surfaces exist, the region has some low basins and barren deserts. These include the Plateau of Tibet (also known as the Xizang Plateau), the Tarim Pendi Basin in western China, and the Taklimakan Desert in western China. All these areas are sparsely populated. One of the largest deserts in the world—the Gobi—stretches from northwest China into Mongolia. It covers more than 500,000 square miles, which is larger than Texas and California combined. The Mongolian Plateau reaches into northeastern China. Northern China encompasses the Manchurian Plain and the North China Plain. East Asia includes a number of important peninsulas. Most of these form a part of China, although one peninsula contains independent nations. In addition, a number of islands off the coast of China include possessions of China as well as independent nations. The eastern coast of China features several peninsulas. These include the Shandong Peninsula, the Leizhou Peninsula, and the Macao Peninsula. Macao was owned by Portugal until 1999, when it returned to Chinese control. Because of its peninsulas, China has a long coastline that has allowed several major port cities, such as Shanghai, to develop. Bordering China on the east is the Korean Peninsula, which contains the two independent nations of North Korea and South Korea. An important feature of East Asia is the continental shelf—the submerged border of the continent—that extends east from China. A number of islands stand above this continental shelf. The isolation of the islands has permitted them to develop in greater security and peace than parts of the mainland. Further, many of these islands have developed trading economies. The islands off China include Hainan and part of Hong Kong. Long one of the major harbors in the world, Hong Kong (while originally a part of China) used to be a British colony. In 1997, Hong Kong once again came under the authority of mainland China. The smaller nations of East Asia are located on islands and peninsulas. For example, Japan is an island nation with enormous economic power. Taiwan is a separate island that at one time belonged to mainland China—and is still claimed by China. China has three great rivers, which have been critical to the development of China’s civilization. The rivers have helped to feed hundreds of millions of people because of the fields and crops they irrigate. The Huang He (or Yellow River) of northern China starts in the Kunlun Mountains in the west. It winds east for about 3,000 miles before emptying into the Yellow Sea. Both the sea and the river get their names from the yellow silt, or particles of soil, that the river carries to its delta. Another name for the river is “China’s Sorrow” because of the terrible floods that it has caused. The Chang Jiang (or Yangtze River) is the longest river in all of Asia. The name Chang Jiang means “long river.” It flows about 3,900 miles from Xizang (Tibet) to the East China Sea. The river has been a major trade route since ancient times. Even today, the Chang Jiang carries most of the goods shipped on China’s waterways. But this river, too, floods frequently, causing a great deal of damage to nearby villages, as well as to the surrounding countryside. The Xi Jiang (or West River) runs its course in the south of China. It flows eastward through southeast China and joins up with the Pearl River (Zhu Jiang) to flow into the South China Sea. The Xi Jiang joins with three other rivers to form an estuary (where the river’s current meets the ocean’s tides) between Hong Kong and Macao. Important mineral resources are located in this river’s valley. The Yalu Jiang is another important river of the region. The Yalu, which is about 500 miles long, forms the border between North Korea and China. It is important historically because in 1950, Chinese troops entered the Korean War by crossing the river and attacking United Nations forces. Natural and mineral resources are unevenly distributed throughout East Asia. China, for example, is rich in natural resources. Mongolia and North Korea also have substantial mineral resources. However, Japan, South Korea, and Taiwan have limited natural resources. Even so, these latter three nations have grown into major economic powers. The number of mountains in East Asia means that the amount of land available for agriculture is limited. For this reason, China’s population is concentrated in the east, where river basins are located. The land in these valleys is highly productive, allowing the Chinese to grow rice and many other crops. In contrast, the mountainous western regions of China are more sparsely populated. Forests are also abundant in the region. China, Japan, Taiwan, and both North Korea and South Korea all have forest resources. Japan has been able to keep most of its forests in reserve by buying timber and other forest products from other regions of the world. 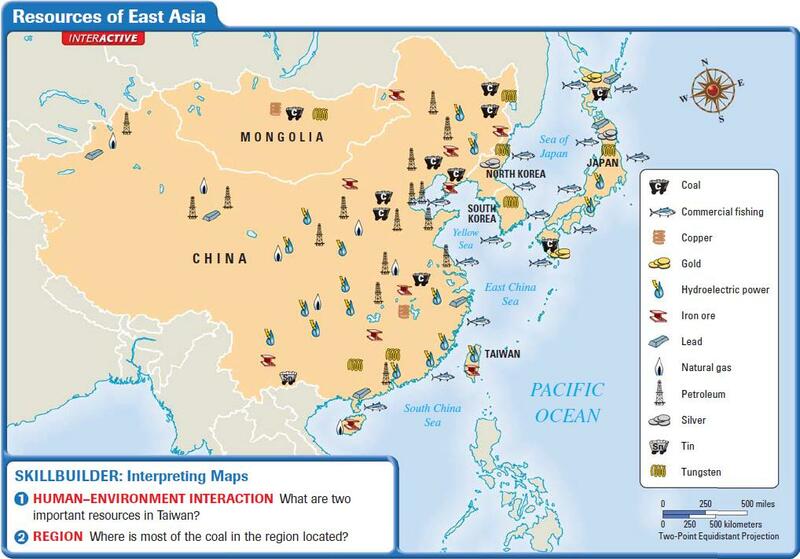 China has large energy reserves of petroleum, coal, and natural gas, and Korea has coal reserves. Japan also has deposits of coal. China’s resources have enabled it to be self-sufficient for much of its history. In contrast, Japan’s shortage of resources has forced it to trade for what it needs. China’s mineral resources include iron ore, tungsten, manganese, molybdenum, magnesite, lead, zinc, and copper. North and South Korea possess important tungsten, gold, and silver reserves. Japan has reserves of lead, silver, and coal. China’s long river systems are important to the country’s economy. They provide crop irrigation, hydroelectric power, and transportation. To control flooding on the Chang Jiang and produce more electricity, China is building the Three Gorges Dam. The Huang He and Xi Jiang also provide hydroelectric power and a means of transportation. People in East Asia look to the sea for food. In fact, Japan has developed one of the largest fishing industries in the world. Japanese factory ships process huge amounts of seafood for human consumption throughout the world, as well as in Japan. You will read about East Asia’s climate zones in the next section. You will also read about its vegetation.